Looking For A Hockley Car Spares Shop? 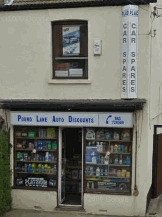 Living in Hockley you may not have heard of Pound Lane Auto Discounts, the number one Car Spares shop in Essex. But we hope that will change very shortly, and you not only know about us, but you’ll start to consider us the Essex motor factors of choice. Pound Lane Auto Discounts are based just outside Basildon in Essex, which makes it a very easy drive from Hockley. And since 1981 when we first opened our doors to the general public we have been supplying car spares and parts to an ever growing band of loyal customers, who travel from all across Essex and the south East of England to visit us. In fact we are constantly amazed at the distances that our customers travel to purchase their car and van spares and parts. Amazed and determined that the loyalty that they show us remains for the next 30 years. How do we entice customers from such distances away to pay us a visit? Well, we have three key areas of focus, which we believe you all want. We try to stock the best range of parts and car accessories anywhere near Hockley or actually the whole of Essex. We have parts for the latest Ford, Vauxhall or any of the models that you will see driving around......you would expect that anyway. But it’s not just the popular makes of vehicles that we can supply parts for. From Hummer to Dodge, from Chrysler to Aston Martin, to unusual imports, there is a good chance that we will have the parts you require sitting on our shelves too. Just contact us on our order form, and we can advise you before you travel if we have it. No one wants a wasted journey after all. But the thing that sets us apart from all other car spares shops and motor factors around the Hockley area is the depth of our range. As being around the motor industry for over 30 years, we ensure that we can go way back in time too. So if you have a classic car sitting in your Hockley garage, or are planning on rebuilding an old model, then Pound lane Auto Discounts can definitely help you out. With a range consisting of brake pads, ignition parts, Clutch kits, Head gaskets, Service spares, body panels, exhausts….ok, literally everything that you would want to replace on your car then you know that you can save hours of time searching for your parts, simply by using Pound Lane Auto Discounts. If we haven’t got it, many of our suppliers can get it to us within a couple of hours, or the next day if the part has to travel from further afield. So that covers the spares and parts that we supply to our customers. So what are the other two areas that we believe will make you drive across from Hockley to us? Well these are simple to state. We try our absolute best to provide extremely competitive prices for our parts. We might not always be the cheapest around, but you can be assured that you will get the cheapest prices that match the quality. Nobody wants to scrimp on brakes for example…so we attempt to keep our costs as low as we can, without making us go broke. Added to all that, the finishing touch to entice you from Hockley is our total belief that we are only as good as the last time you visit. So you will experience the kind of old school customer service that your Grand-dad would have expected. It doesn’t matter if you want a full service kit, or just a nut and bolt we will try our best to provide. No unfortunately we don’t as we just don’t have the resource to deliver parts. Being a little old shop, we have to focus our time on the areas that make the most difference to our customers. And that is finding, ordering, and selling parts to anyone who visit us. So contact us by all means, and we will get your car spares ready for collection. A quick drive and its job done! There is a link at the bottom of the image which will take you to Google Maps, so just enter your postcode in the field for directions that you can print up. And that desire to take the unwanted effort out of your driving and motoring experiences is why the town of Hockley, have the perfect car spares accessories shop right on their doorstep.